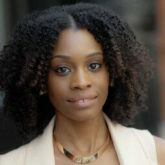 Say hello to your new curlfriend, Priscilla as she explains the benefits of the shingling technique for natural hair! Natural haired gals know the struggle! It takes a lot of time, experimenting, and lots of patience until you find the hair styling method that works. Whether it’s nailing how to use a diffuser, trying your hand at the plopping technique or the shingling method, there are countless methods out there for curly hair—you just have to try them all! 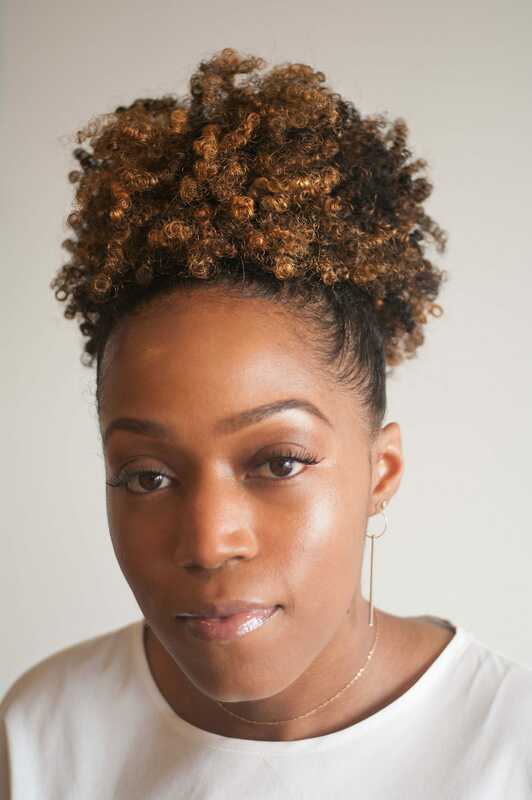 Let us introduce you to Priscilla Quaye—better known as Curlcilla on Instagram—who we recently stumbled upon when we were checking out her Sunday hair styling routine on Yahoo Style Beauty’s Insta story and the results had us wanting to know more. Priscilla has managed to get the shingling method down to a science! So, we decided to pick her brain to learn her secrets. This is the method behind what some of us may call the shingling technique madness. Some of us just can’t get it right! All Things Hair: What is your hair type? Priscilla Quaye: My hair type is a mixture of mainly 4a with a bit of 3c. I have tons and tons of coils, ‘s’ curls, and some ‘z’ curls. I also have a ton of shrinkage, and my hair tends to stay on the shinier side. To be honest, I’m actually not that into hair typing! I personally think knowing your hair porosity, density and strand diameter are more important to figure out how best to take care of your hair. In that regard, my hair is low porosity meaning it takes more effort to get moisture in, high-density, meaning, in short, that I have a lot of hair on my head, and my individual hair strands are fine. What kinds of styling techniques do you prefer to use on your hair and why? In terms of how I use my products, I always use the LOC (Liquid-Oil-Cream) Method as my base no matter what style I’m doing. As mentioned, my hair is low porosity, so the LOC Method helps me to ensure that all that moisture I took the time to get into my hair stays in by the layering involved in the LOC Method and the locking in of the moisture with an oil. This might be an obvious one but I know not everyone does this, so it’s still worth mentioning! I think sectioning is key for doing your hair in not just styling, but in every step! Washing, deep conditioning, and styling! It allows you to ensure you are reaching every strand of hair and also helps you pace yourself. Tackling a smaller section and getting through it is always easier than looking at a big one and getting frustrated. The last one is the shingling technique, but I’ll get more into that below! Can you tell us a bit more about your shingling technique? How long did it take you to finally nail down the routine? Are there any tips you can share with our readers? I swear by the shingling method! My last relaxer was in June 2011, and I big chopped a year later in June 2012, so I’ve been fully natural for 5 years. However, I didn’t always style my wash-and-go this way, and used to just finger comb or “prayer hands” my product through, but have now been shingling for the past year. The difference I’ve seen with shingling is truly astounding (to the point where I’m asking myself why wasn’t I doing this before, haha). It took me a month or so to feel comfortable with the technique and every month after that I’ve been getting faster with it as well. When I move on to styling my wash and go after shampooing or co-washing, I first split my hair into two halves and apply my leave-in and my sealant which is castor oil most of the time, but sometimes coconut oil. Then to start the shingling method, I section my hair into small sections. It’s much easier to work this way since the process is fairly laborious (but worth it!). I take the first section and spritz it with water so it is dripping, but not drenched, and apply my curl cream. I apply the product to the section first by finger combing it through making sure the section is saturated. After this is where the shingling comes in. I take each individual curl where it naturally starts to separate in between my index finger and thumb and starting at my roots, smooth the curl downwards to the end. I repeat this until the section is finished, and then all throughout my head. As my hair is quite long and very dense as I mentioned earlier, this does take me about an hour. 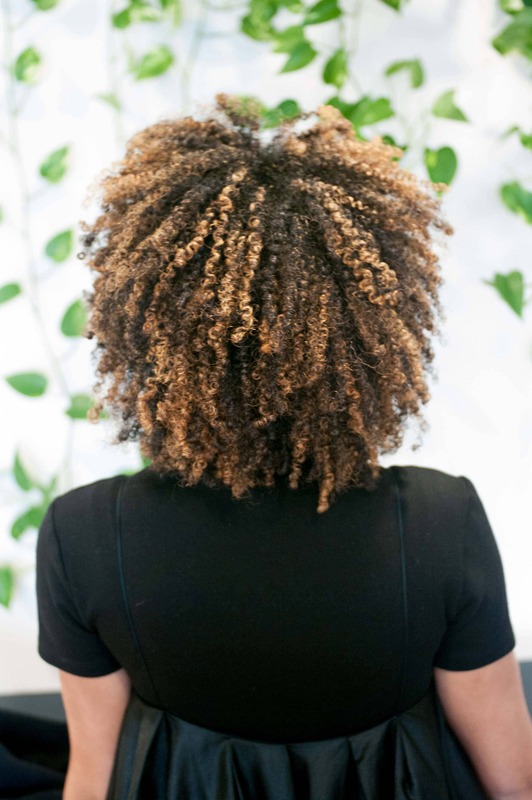 *Because the shingling method allows me to separate each curl where it naturally would fall, this leaves less chance for my curls to tangle around each other. As a curly girl, you will of course always have tangles, but I have definitely noticed less with this method. Any tips for styling and caring for natural hair types like yours? Number one is absolutely moisture, moisture, moisture. All textured hair craves moisture, but especially my hair type. I am crazy about my deep conditioning routine, doing it religiously every. single. week. I maximize this by always deep conditioning with my hair steamer. This really helps to ensure the deep conditioner penetrates my strands (which is key for my low porosity hair). Also, I recently colored my hair for the first time, so the routine is even more essential for me. I only took the plunge to color because I was already so consistent with deep conditioning and making sure my hair was moisturized. So I knew that my routine wouldn’t have to drastically change for the color. Editor’s Note: We love Suave 2 Minute Intense Moisture Super Conditioner! Editor’s Note: If you want to take a peek at Priscilla’s shingling method, check out her Instagram! Havana Twists with Khalia Harrison.